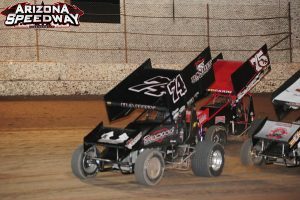 ASCS Wing Sprint Cars Series returns to Arizona Speedway this Saturday night with IMCA Sport Mods, Dwarf Cars, Pure Stocks and Robert Horne Ford Bombers. Headlining the evening, the Southwest series comes into the event with 9 time champ, New Mexico’s Rick Ziehl leading reigning champ Colton Hardy by 17 points as the season heads towards a conclusion. Billy Chester sits in third just one point over early series points leader Jesse Baker who has one win on the season. Joshua Shipley resides in fifth after a mid season team change landed him in the seat of the Speed Sport, Mark Clark owned machine. This will be the final ASCS event at Arizona Speedway before the 3rd Annual Copper Classic held November 23-24. With the IMCA season in the books, Sport Mods still have track points on the line and Chase Alves leads the division followed by Mark Harrison and Jason George. Dwarf Cars of Arizona are led by Cory Brown, with Eddie Schuhle and Dusty Jager in the second and third spots. Pure stocks return with the season long battle between Larry Brigner and Kevin Parker. Both have recorded 560 points and are tied for first. Winner of the last event Darryn Werkmeister is 13 points back in third. Robert Horne Ford Bombers round the card as they close in on seasons end with Jason Knueppel leading Toby Wibeto currently second and Cory Parent third. All three drivers will look to pick up their first win of 2018. Green flag flies at 7:00pm October 6, with grandstands opening at 5:0pm and pits opening at 4:0pm. Tickets are available at the door. Pricing for this event, Adults $15, Seniors and Military (with ID) $12, kids 11 and under are free. Pit passes $35 , kids 7-11 pit passes $15 and kids 6 and under free. Arizona Speedway is located within ET Motopark at 48700 N Ironwood Dr. San Tan Valley, AZ 85140 5 miles south of US60 on Ironwood Dr. Call the hotline or logon to www.ArizonaSpeedway.net for more info. 480-926-6688 . Follow us at www.Facebook.com/ArizonaSpeedway .